Our prototype hovering rocket vehicle is almost ready and the first tethered test could take place any day now. Note that the vehicle doesn't have any legs yet since it will be fully suspended by tethers for the complete duration of the test. 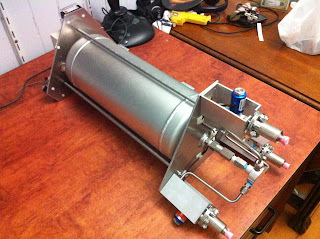 This prototype vehicle uses pulse modulated monopropellant thrusters.